When Jared Stone finds out the devastating news that he has terminal cancer, his thoughts automatically turn to his family - wife, Deirdre, and teenage daughters, Jackie and Megan. Wanting to provide for them financially after he is gone, he decides to auction off his life on eBay to the highest bidder. Ultimately, the Stone family end up being the subject of a reality TV show. Soon their family home is overrun with cameras and crew, with every move they make being recorded and edited in to an hour long show being run each evening to much success. Being someone who loves reality TV, the blurb really piqued my interest and I was keen to see the story unfold. Unfortunately, the story of Jackie and the Stone family didn't feel that well executed to me. The blurb of the book alludes to Jackie being a very central character, and whilst she is in many respects, she is far from the main character. In fact the story is told from multiple viewpoints, and that in itself led me to feel disconnected from the cast of Life in a Fishbowl. There were too many stories going on at the one time, and had their been more focus on the one central story - the Stone family and the grieve that comes with a terminally ill family member, I think I would have rated this book higher than three stars. As I mentioned above, there are a vast number of characters in Life in a Fishbowl, all playing central roles. There is the Stone family themselves; Jackie's online friend, Max; a crazed millionaire who wants to kill Jared, Sherman; a nun, Sister Benedict; teenage World of Warcraft player, Hazel; reality TV producer, Ethan; and also the brain tumour itself, Glio. If you kept up with that list, you'll know that's ten characters. I don't know about you, but for me, that's a lot to keep up with. I wasn't able to connect with the characters in Life in a Fishbowl, mostly because of how many there were, but also because I didn't find them all to be entirely believable. Actions from certain characters felt rather unreal to me, and I also felt like we only scratched the surface level of the Stone family. Now it may sound like I really wasn't keen on the characters as a whole in this book, however, the one character element I really did enjoy was giving the brain tumour its own viewpoint and place within the book. I thought that a clever writing tactic, and felt like the character, Glio, really added to the overall story. Although a slow starter for me, I read the last half of Life in a Fishbowl pretty quickly as the story really picked up then - I think of the first half being character introduction and the last half being the unfolding plot. One thing I would like to note about the writing style is the fact that I was a little confused at points... Life in a Fishbowl is marketed as a YA adult book, but at times I questioned whether it was actually young adult or adult fiction. Had the story been told from just the view point of Jackie, as the blurb alludes, I think it would have been more YA friendly. 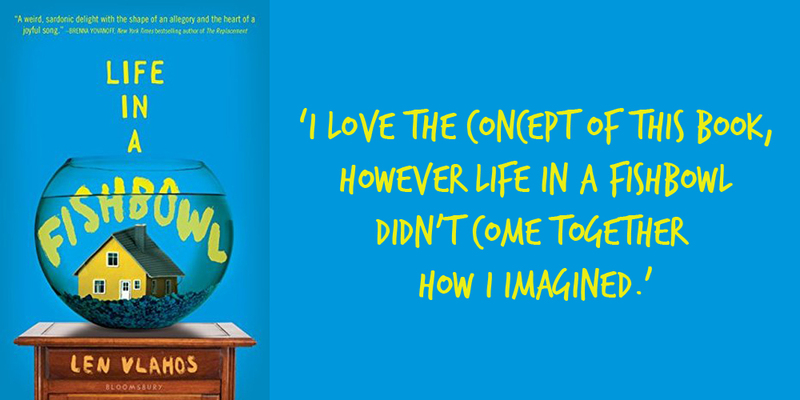 I love the concept of this book, and for that reason I would be intrigued by other works of Len Vlahos, however Life in a Fishbowl didn't come together as I had imagined. The synopsis of this book also caught my attention. I have an unhealthy love of reality TV. Sorry the book didn’t really work out for you, though. I’m still undecided about reading it. As a reality TV lover, I see why the synopsis caught your attention. If you do pick this one up, I hope you have a better reading experience! I am sad this wasn't as good as you hoped, but it still sounds interesting. It is an interesting read for sure; I hadn't come across a concept quite like it.